Calderón likens his most current exhibition to Kurt Vonnegut's Slaughterhouse Five in which moments of the past and present are interlaced without division. His work not only embodies a non-linear timeline but also an askew relationship to nature, life and death, art historical references and religious imagery. Perhaps surrealism is not only an imbedded Mexican aesthetic, but truly reflective of the chaos and ambiguity of Mexican life. Calderón's work pivots on the incorporation and interpretation of his personal experiences and of his strangely unpredictable life in Mexico City. There is something profound in exposing these inconsistencies, there by questioning power structures and perceived norms. This exhibition includes two bodies of sculptural works, photographic works, paintings and a comic book Calderón wrote in collaboration with Nick Waplington. Calderón continues to be interested in the varying effects of working with a variety of mediums. Not only does each provide an alternate perspective but each medium also has its own history. Mexican culture is rich with "artisans" – painters, sculptors, illustrators etc. If Calderón is not actually employing the physical hand of these artisans, which he does through this exhibition, he is always referring to technique and style. The content of Calderón's work intertwines with the medium of the work. 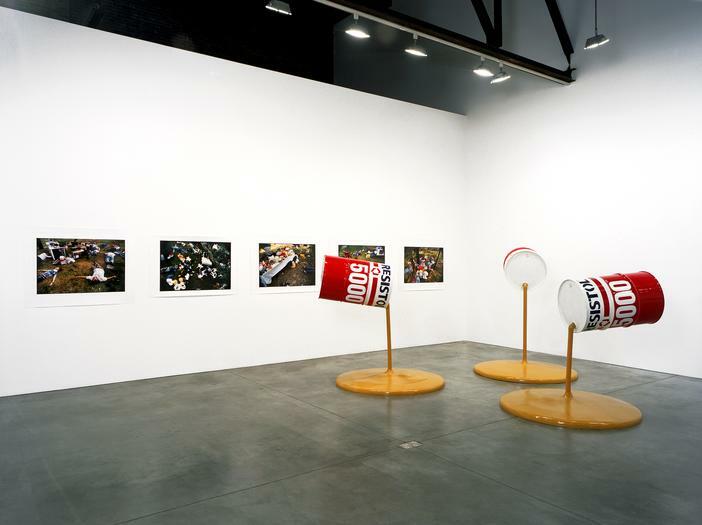 "Resistol 5000" is a series of three large-scale sculptures of glue cans crafted after Miguel's descriptions, creating a fabulous hybrid of the story of debauched teenage city life and rustic hand. Each can is suspended upside down by three various dripping forms referential to nature. The frozen glue alludes to an atrophied cerebral state of mind. While the works appear to replicate of real objects, they also reference the fantastical states induced by sniffing glue, a common form of party entertainment and another way to escape and forget their everyday lives "They are as if another form of nature is coming to life. Like seeing a natural disaster, that even though it's tragic, it is aesthetically pleasing to the eye", says Calderon. "Falcon", one series of photographs included in this exhibition, incorporates what Calderón refers to as the three things that most affected his teenage years and liberated him from the stressful life of adolescence: a BMX bike, a falcon he raised and trained, and his best friend. The material objects become ritualistic for Calderón. In this series (for which he re-acquainted himself with his childhood friend and who also stands in for Calderón) the triad reappears to create a myriad of scenarios. Calderón collaborated with various families he approached while they were picnicking to create a body of photographs called "Chapultepec Mexico". These photographs show various families, each who seem to have suffered a disaster and who subsequently all lie dead in the park. "‘Chapultepec Mexico' sometimes seems to me so full of life but sometimes it seems like everyone and everything could die at any second". The centerpiece of the exhibition is "Bar Rustico Montanoso", a 3-ton concrete sculpture that appears to be a rustic folk bar carved from wooden logs. Its style is reminiscent of the aesthetic of a place named La Marquesa where Mexican families take their children to escape the city. They typically eat a lot, rent loud motorbikes and ride horses. "There is a flock of new bars opening in Mexico that maintain a style that is supposed to be in ‘good taste' and in many ways resemble a gallery, a white cube. The purpose of "Bar Rustico Montanoso" is to create a space that architecturally can be considered tasteless but when you sit at it you get a sense of happiness and wholeness."